VANCOUVER, B.C. 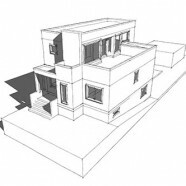 – – This renovation required replacing the existing roof/attic with a new half-storey – as well as a reconfiguration and thermal upgrading of the main level – in order to gain more usable space and take advantage of the passive solar gain. Towards this end, the upper level addition was pushed to the north side of the house – making room for a large south-facing rooftop deck and allowing easy solar heat collection. wonderful, south facing mezzanine level open to the kitchen below allows the suns rays to penetrate into the public spaces of the home that are lined along the north side of the main level. This facilitated the elimination of all existing north-facing windows (from which heat is lost). The renovation stayed within the existing building footprint – for both environmental and economic reasons – and allowed for upgrading the existing building envelope to a much higher level of energy-efficiency. Additionally, it is intended that all flat roofs be planted for added thermal (and ecological) benefit. Although the building footprint is the same and the interior reorganization of the existing main level were modest, the openness and light-filled spaces of final design are very different from the tightly compartmentalized original home. Furthermore, the generous rooftop deck adds another unique outdoor space that extends the interior living spaces to the exterior. Ultimately, this small project shows that a delightful living environment can be created modestly within the confines of a limited space and budget.